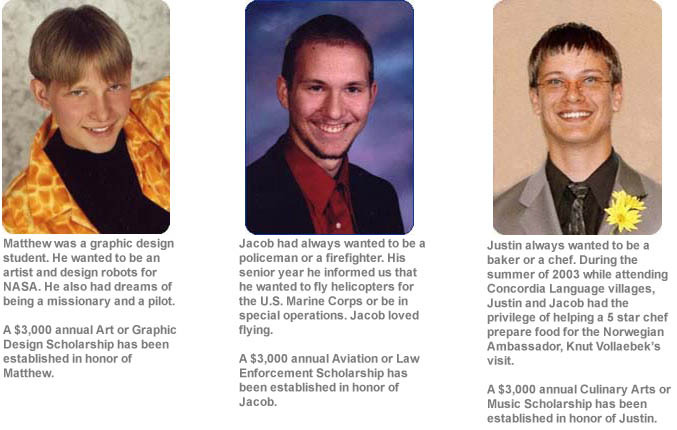 The Northwest Pilot’s Assistance Fund established the Backstrom Memorial Scholarship Program in 2009 in memory of Matthew, Jacob and Justin Backstrom. They are the sons of Captain Nathan Backstrom, his wife Connie, and brothers to Ryan and Charles. The three brothers, wearing seatbelts and driving responsibly, were tragically killed by a drunk driver October 10th, 2004. *Dependent children are defined as biological, stepchildren or legally adopted children living in the pilot’s household or primarily suppored by the pilot. If selected as a recipient, the student will receive a $3,000 award. In the event that there are not qualified appicants for all three areas of study, more than one award may be granted in one of the other areas, for a total of three (3) awards each year. Preference will be given to those students who are home educated. Selection of recipients is made by Scholarship America. In no instance does any officer or employee of the Delta Scholarship Fund, Inc. Delta Air Lines, Delta Master Executive Council (ALPA), or the Backstrom family play any part in the selection. All applicants agree to accept the decision as final. Applicants will be notified in May. Not all applicants to the program will be selected as recipients. Students may reapply to the program each year they meet eligibility requirements. Scholarship America processes scholarship payments on behalf of the Delta Scholarship fund. Awards will be paid in one installment in early August. The Delta Scholarship Fund has partnered with Scholarship America. Selecting the button below will redirect you to the Scholarship America Student Hub!